Dumbo the flying elephant flies high above the clouds! There must be some extra magic in that "diamond dusted" feather he's holding. Delightful statue based on Walt Disney's animated classic Dumbo. See Dumbo the amazing flying elephant fly high above the clouds in this colorful interpretation by pop artist Romero Britto! There must be some extra magic in that "diamond dusted" feather that helps Dumbo soar. 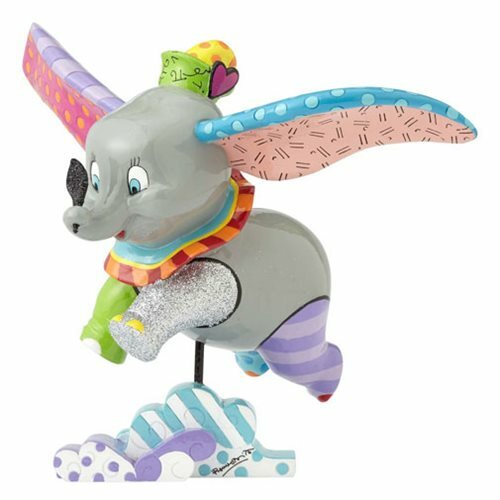 The delightful Disney Dumbo the Flying Elephant Statue by Romero Britto is made of stone resin and measures approximately 7 1/4-inches tall x 7 1/4-inches long x 7-inches wide. Pair him with Timothy the Mouse (sold separately) for even more Disney fun!